before they become a hurdle in the sales process. The new agent routinely looks for the solution to providing the right answers to their clients’ concerns. The questions they ask, the fears they present, the roadblocks they create and the challenge of their misunderstandings, all can get in the way of moving closer to the real estate transaction. In addition, great experience in converting ‘the interested’ into ‘the closed’ still won’t make you bullet proof to misinterpreting or mishandling a clients objections, here and again. Listen to every question asked, chances are they’re being asked online as well. Each opportunity to overcome these challenges will be as much a learning experience for the agent as they are for the client. Each successfully handled hurdle needs to be documented for the next opportunity, preemptively preparing and incubating your audience. The Solution: Develop objection handling in your blog. Below are some examples* of common real estate and mortgage ‘hurdles’ and potential headlines for articles to preemptively squash them. 1. We’re not ready to really do anything yet. 2. The interest rates are not low enough. 3. We’re just in the looking around phase. Why “Just Looking” Can Cost You Your Dream Home. 4. It’s just too much hassle to consider right now. Exactly Why The Real Estate Transaction Process Is Easier Than Getting A Tattoo. 5. We’re really not in a position to be making this kind of a financial decision. 6. My cousin is in real estate. 10 things That Other Real Estate Agent Doesn’t Want You To Know About Me. 7. We’re going to go ahead and sell it ourselves. 8. Your commissions are too high, we’re going to go with a discount real estate company. Discount Real Estate Comes At A Price Some Aren’t Willing To Pay. 9. The closing costs are more than we can afford. The Absolute Truth About Closing Costs, And Why You Can Afford Them. * Please be aware that I am not a Realtor, and that these are mostly mock titles intended to accent my point. Handling the objection before it has a chance to rear its ugly head is the objective. Your readers will relate and trust that you understand their concerns and needs, bringing them closer to working with you. He Asked Me, "Why Am I Blogging?" Is that like “removing the Elephant from the room”? On a serious note, I thought you brought up several good points and lots of excellent article ideas. I would offer that I think the main benefit for writing along these lines would be improving / clarifying one’s own skill rather than incubating an audience. But the idea of bringing up the objection first is a well established sales principle. See how I said that like I know what well established sales principles are? This is alternately known as “positioning oneself as an expert” or “better living through BS”, depending on who you ask. Yes, I already find myself referring clients to my blog because they are asking questions that I already answered. I met another agents clients yesterday at an inspection. When they met me they began gushing over reading my blog everday and how it’s been so helpful to them and answered a lot of questions that they had. I thought to myself…”why didn’t you call me instead of your agent then”. I think everyone else should change the wording in these headlines. I like them just as they are. Do I get dibs? These titles for posts are great. Great idea starters. My advice would be to take these headlines and put them into your own words. The last thing we need is 10,000 articles all having the same title. 1. That was the client walking away from your objection bumbling. I am sure that bloggers that are “giving away their trade secrets” are some how incubating clients for other agents… but I truly believe that you will be attracting more through your efforts than you would have if you remained silent (not that blogging makes much noise). LOL John. “Better living through BS”. 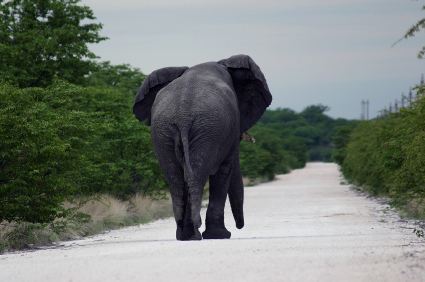 All elephants walk on tip-toe because the back portion of their foot is made of no bone just fat. An elephant can smell water 3 miles away. An elephant could carry up to 2 gallons of water in its trunk. An elephant may consume 500 pounds of hay and 60 gallons of water in a single day. An elephant’s trunk contains more than 50,000 muscles. Looks like better titles for the same content I see on real estate web sites. Who needs an elephant in the room when you have the headlines in the local papers to overcome…I like the article titles.. very catchy..
Super suggestions. Our marketing meeting this afternoon centered on making sure we were providing information the consumer is needing and in terms they can understand. Your blog will be a fine follow up to that discussion. Doesn’t seem like many agents want to help one another these days and it’s nice to see that there are still those who give back and share. Though you may think that they’re helping other agents “steal your future clients” by posting articles like these, it will come back to you ten fold in the future. Thanks for these suggestions–great inspiration for posts, as well as printouts to hand out at open houses, or any other place that seems like the right time and place. This post really helps to spark ideas for generating meaningful content. In addition, it establishes industry knowledge on top of neighborhood knowledge.